This book gives great insight into why some colonists decided to rebel against Britain, while others decided to remain loyal to the mother country. It is so interesting to see how these decisions come about, even to the point of dividing families. Benjamin Franklin and his illegitimate son, William, were very close, sharing their work, thoughts, and ideals. William joined the British army and was later appointed by the King as the governor of New Jersey. He felt obligated to the King for his livelihood, and had no intention of betraying him. Benjamin, however, after spending ten years in London saw how colonial representatives were often mistreated or ignored, and realized that a split from Britain was necessary. Benjamin and William eventually grew so far apart that they no longer spoke to one another for long periods of time. 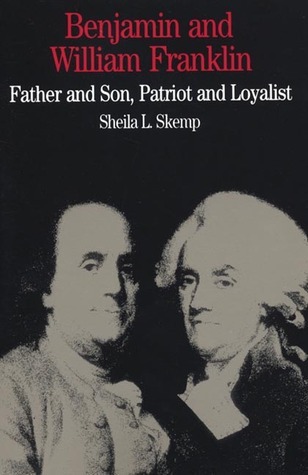 Not only was some great research done for this book to illustrate the differences of opinion between Patriots and Loyalists, but it also includes some primary sources such as letters between William and Franklin, and also correspondence with other influential figures of the time. It is a great resource for gaining an understanding of thought prior to the American Revolution. This book was not fantastic at all. The problem I had for it was that as a novice historian I realized quickly that it was not written for me. It is written for a popular student audience. The history books that intrigues me are written for academic historians. I may sound pretentious, but I'm being honest. I read history to better understanding historiography. If I want to learn about past events, I read classic literature.The story of Ben and his son is an interesting one, though, and this is a decent start for someone who is interested in a simple read. I just wanted better historiography and a more substantive argument in the book. But they were no where to be found. While I found this book pretty boring (probably because I had to read it for school) I really enjoyed learning about William Franklin. I have never learned about him before in High School, so I found that part of this book very interesting. I wasn't really into the rest of the book, but I did appreciate it. An extremely detailed account of one of the most noted revolutionary figures and his relationship with his equally (at the time) notorious son. Illustrates the forces that pulled both the nation and families apart. Really good read. I especially liked the primary documents in the back (letters between the Franklins, ect.) It gave so much insight not only to what the loyalists like William Franklin went through, but also showed the attitude towards England in the colonies in general. Currently reading for a US History survey class I'm taking this term. Better book than I thought it would be being a class textbook.Remarkable story of father and son, especially when the American Revolution begins to come around.